FOR SALE: 1 1/2" and 2 1/2" scale lost wax injection molds. Both molds priced together along with the industrial wax injector. 1 1/2" scale Stainless steel coupler lost wax injection molds. Includes 3 separate injection molds; Knuckle mold, Lift Pin mold and Main body mold. Includes the samples shown in photo. 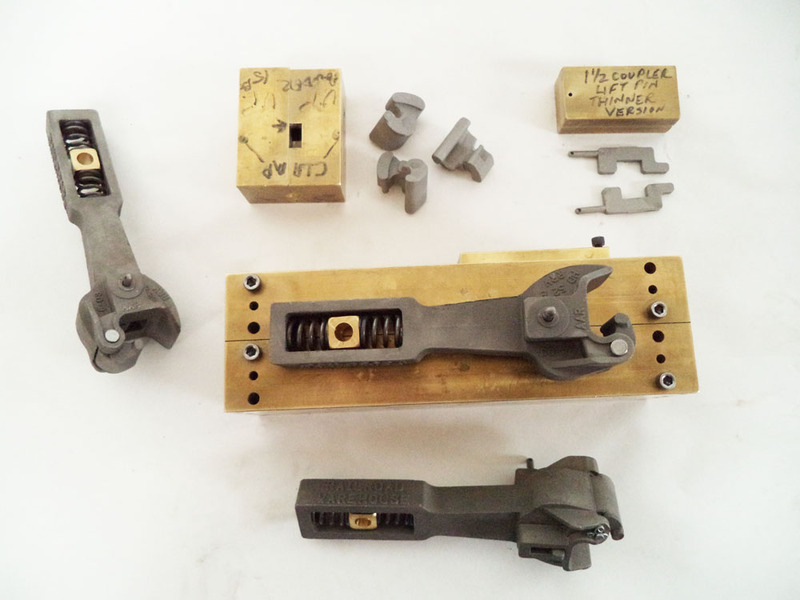 The Main body mold, Knuckle mold, and lift pin mold are machined from solid brass. Inject the molds with wax, release the parts from molds, and ship the waxes to the foundry for processing into bronze or stainless steel depending on what you want in strength. The coupler samples have the Railroad Warehouse name on the loop shank side, but you will get a blank name tag mold insert that you can either leave blank or engrave with your name for product advertisement. The coupler is approx. 7 1/4" in length. 3/4" thick loop shank. Sample assembled couplers included. Photo below is the 2 1/2" coupler mold. 2 1/2" scale Stainless steel coupler lost wax injection molds. Includes 3 separate injection molds; Knuckle mold, Lift Pin mold and Main body mold. Includes the samples shown in photo. The Main body mold is machined from solid brass (weighs in at 60 lbs). 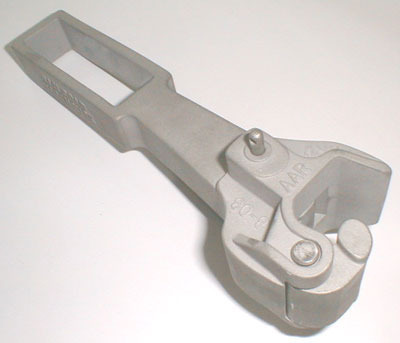 The Knuckle mold is machined from Aluminum. The lift pin mold is machined from sold brass. 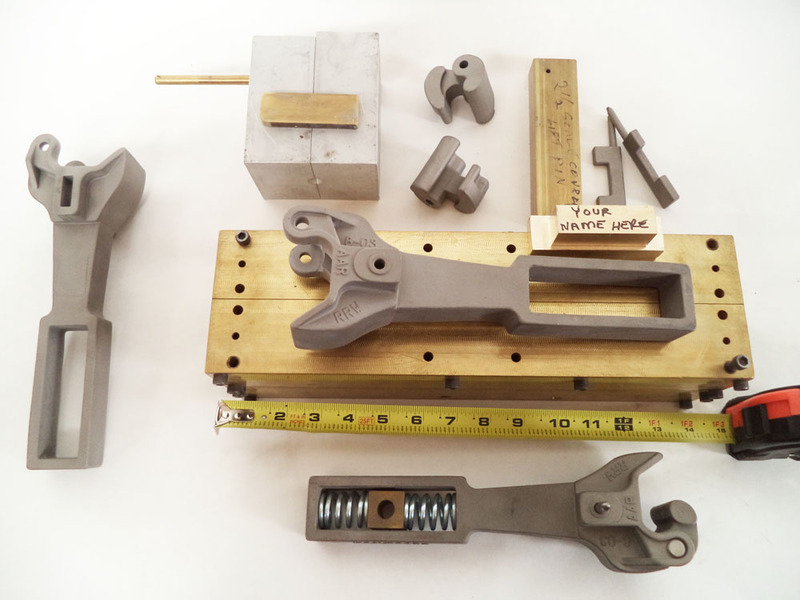 Inject the molds with wax, release the parts from molds, and ship the waxes to the foundry for processing into bronze, stainless or aluminum depending on what you want in strength. The coupler samples have Railroad Warehouse on the loop shank side, but you will have a blank name tag that you can either leave blank or engrave with your name for product advertisement. The coupler is approx. 10 1/4" in length. 1 1/8" thick loop shank. Also included is the Industrial Wax injector that is needed to inject the molds with. Industrial wax injector is designed to handle larger capacity wax injection molds. Operates on 110v (regular outlet plug) + compressed air is needed.